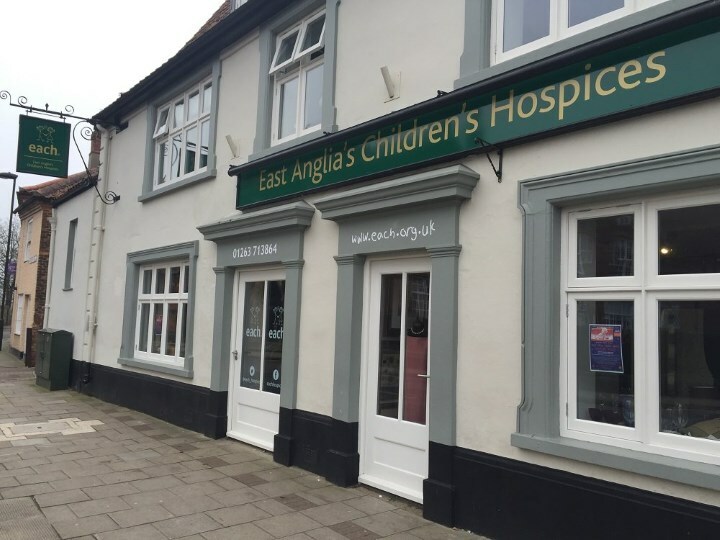 In her role as patron of East Anglia's Children's Hospices, the Duchess of Cambridge opened a new EACH charity shop in Holt, Norfolk. Located just forty minutes from the Cambridges country home, Anmer Hall, market town Holt has been a favoured shopping haunt for Kate over the last couple of years, with several outings to the nearby Mew Antique Emporium and local grocers reported. Most recently she stopped by a café and farm shop where she treated George to an ice cream. 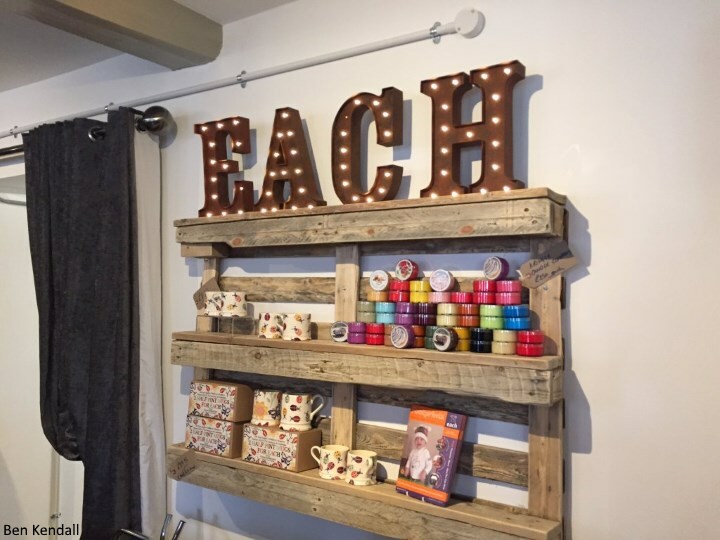 The new shop in Holt is EACH's 21st in their retail portfolio and forms part of their ambitious plans to expand their network of shops even further over the coming years. The charity has stressed the importance of having a presence in Norfolk for some time - it's an area in which many EACH families live and where so much care is delivered. The Duchess received a very warm welcome. Ahead of the visit, Tracy Rennie, EACH Director of Care said: "We are delighted the Duchess of Cambridge will be taking the time to help us celebrate the opening of our new shop in the beautiful town of Holt. We’re really looking forward to becoming an integral part of the town’s thriving and friendly community, and are confident local residents will help us make the shop a great success." 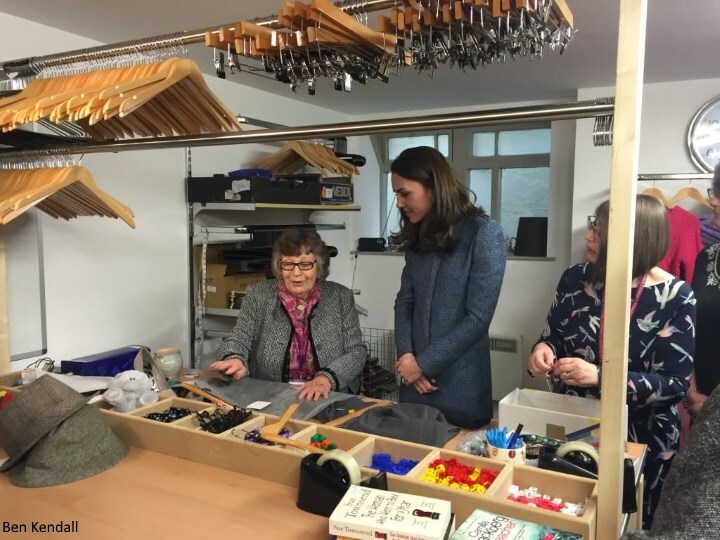 Tracy Rennie took Kate on a tour of the shop where Kate had the opportunity to meet a number of staff, families and supporters, including seven EACH shop volunteers with a combined service of more than 130 years. Kate quickly spotted a hat she liked the look of. A peek inside the shop. Kate bought a book, Fireman Sam’s Favourite Tales, as a present for Prince George and a Beatrix Potter Tom Kitten figurine for Princess Charlotte. Kate helped sort clothes in the back room. 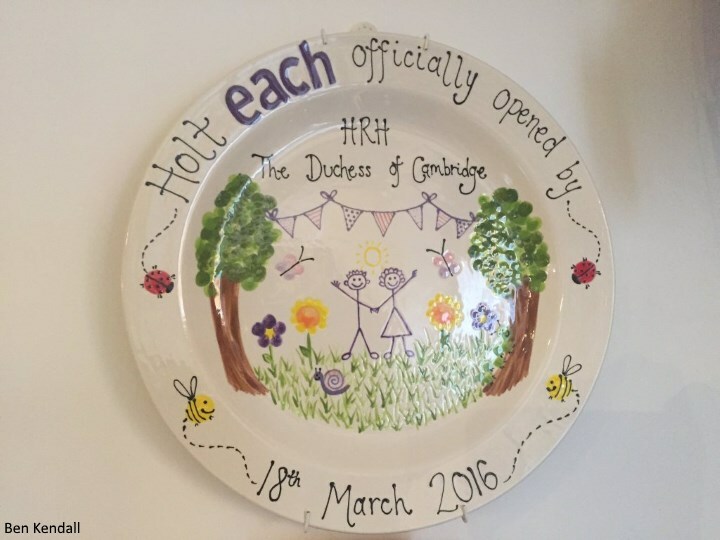 A commemorative plate to mark Kate's visit. 'Local support worker Helen Jacobs-McGee took wheelchair-bound Jill Carrette along to catch a glimpse of the Duchess and were thrust to the front of the crowd after Jill broke down in tears when photographers blocked her view. Kate met eleven-year-old Rebekah Hughes, who suffers from Dravet Syndrome, a severe form of epilepsy, inside the shop. Rebekah enjoyed showing Kate her favourite things - leading the Duchess by the hand to a display of handbags and jewellery. Rebekah said her favourite item was a silver Gant hadnbag, to which Kate replied "We better put a reserved sticker on that. Shall we put a reserved sticker on it so no one else buys it?". The girl then asked Kate what her favourite item was and she chose a £1 penguin brooch before adding "There are so many wonderful things". 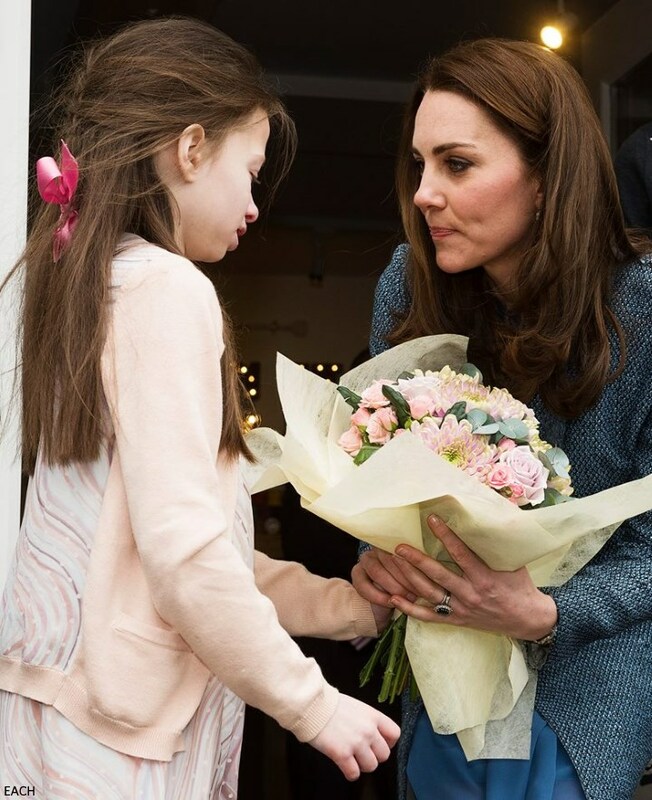 Rebekah also presented the Duchess with a posy. 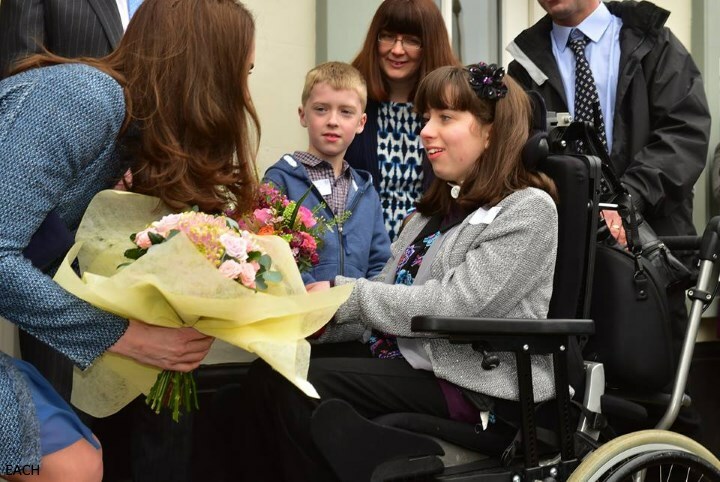 The Duchess also met fifteen-year-old Chloe Baird who has been receiving care and support from EACH since 2009. She was diagnosed with a Dermoid Cyst in the back of her brain. Despite several difficult operations Chloe is unable to walk and relies on a wheelchair. Chloe's mum Sarah said: "The respite and nursing care we receive is really beneficial, as Chloe has atracheostomy and can only be left with me or my husband Guy, or a trained nurse. It's also enabled Chloe to attend school once a week with an EACH nurse, until a one-to-one carer at the school could be fully trained." More than 700 children, young people and family members are currently receiving care and support at EACH, including over 300 from EACH’s hospice at Quidenham in Norfolk. More than half of their care and support is delivered in the family home and community, including North Norfolk, in surroundings familiar and comfortable for the family. EACH relies on voluntary donations for the majority of its income, and this year alone needs to raise £2.5 million from retail activities and a further £5 million from fundraising. You can find a list of the organisation's charity shops dotted in 19 locations across East Anglia here. 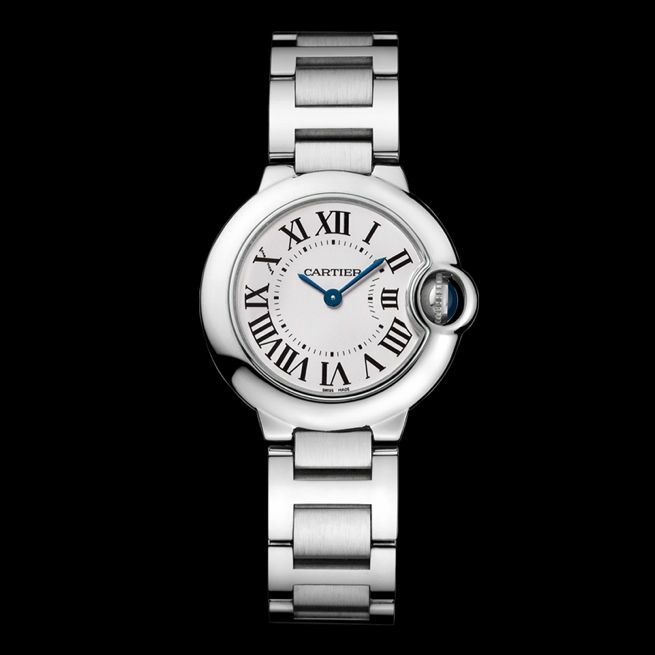 If you'd like like to support EACH the charity has an online shop which includes the £6 bracelet Kate wore (it was designed by Imogen Sheeran, mother of the very famous Ed). 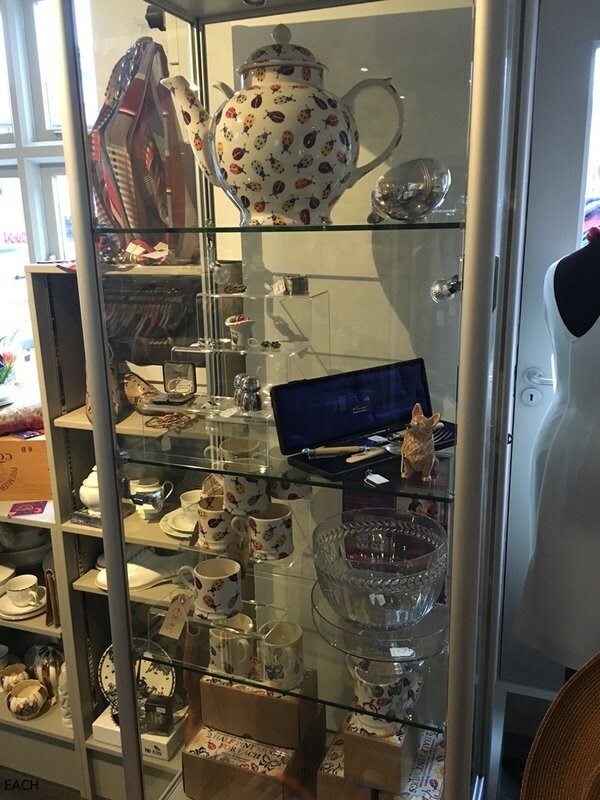 The Emma Bridgewater Two Half Pint Mugs and the Emma Bridgewater Bag are also available with a portion of the proceeds going directly to the charity. Afterwards, Kate marked the opening of the store by cutting the ribbon. 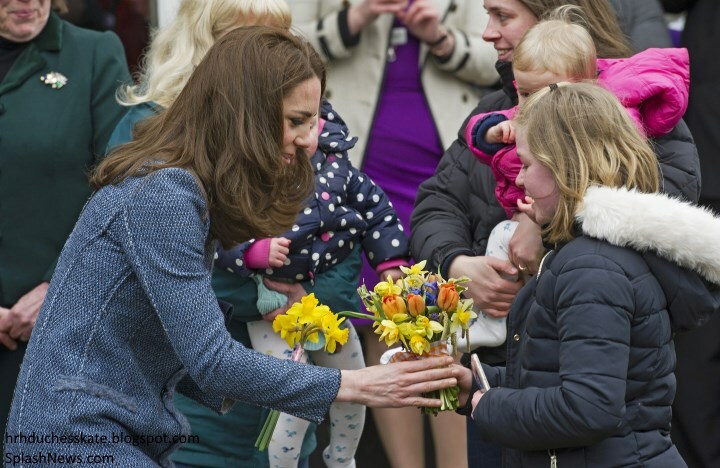 Before leaving, Kate received several bouquets. In many ways, today's appearance solidifies the importance of 'ribbon-cutting' ceremonies for me. It's an area the younger royals are keen to do less of in favour of other types of engagements but seeing the excitement and anticipation from EACH staff and volunteers on social media it's clear it still very much has an important place. The fact Kate officially opened the shop will undoubtedly be a considerable draw for potential customers in the area, and press the opening receives is invaluable. 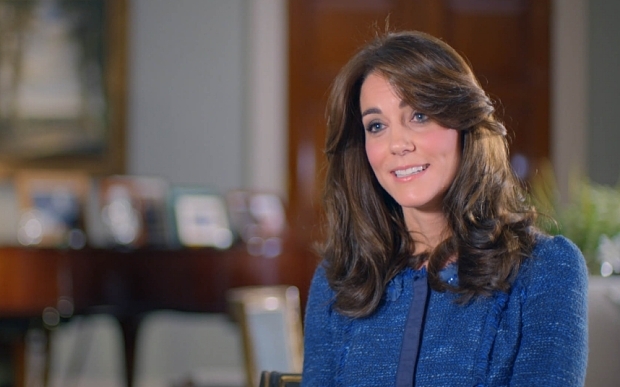 EACH is an incredibly special charity; it was one of Kate's first patronages, the charity she gave her first speech for, and recorded her first video message for. They are doing outstanding work and it's brilliant to see them expanding and doing well. Wishing them every success in their plans for the years ahead! Kate's ensemble today needs no introduction. The Duchess repeated her M Missoni tweed coat which she previously wore during a 2012 visit to Fortnum & Mason and again that year for a trip to Nottingham with William and the Queen. Kate wore it again for the 2014 wedding of Lucy Meade and Charlie Budgett. 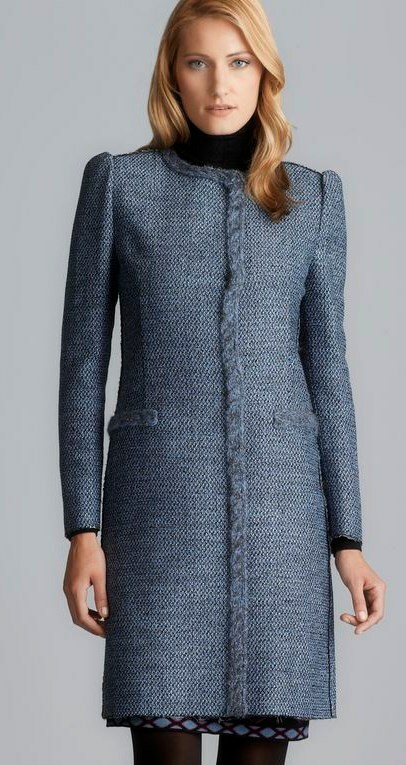 The Duchess bought the light blue coat several years ago at Bicester village. The collarless, knit bouclé piece features fringe trim. It is from the Autumn/Winter 2010 Collection. Underneath, Kate wore the cornflower blue ZARA dress she memorably wore the day after the royal wedding. She's worn it under coats (including the M Missoni) several times since. 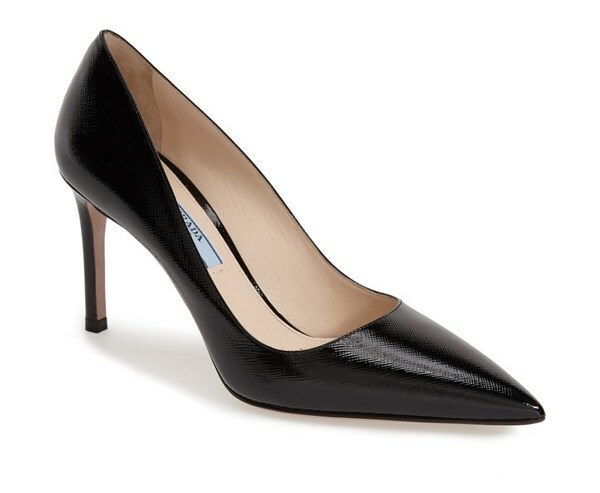 The Duchess sported a pair of new Prada Pointy Toe Pumps (with thanks to The Royal Cambridges). Below we see the shoes in black at Nordstrom. And her Cartier Ballon Bleu watch. Kate completed the look with her navy suede clutch. There's a lovely video from the visit available at YouTube. Before we leave you, we have an exciting update to share. ITV has confirmed it will air the highly anticipated Queen at 90 documentary on Easter Sunday, 27 March from 8 - 10 pm. The programme will include Kate's first interview since her marriage to William almost five years ago. 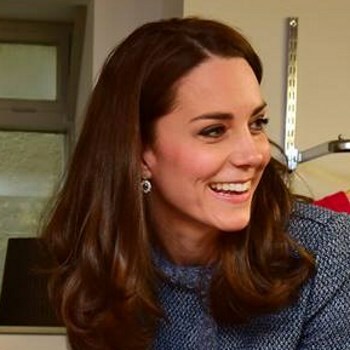 The Mirror shared quotes from Kate's interview and an excerpt from the programme. As you can see, the Duchess wore her blue tweed Rebecca Taylor suit. Another treat from the video is a look at Kate's icy blue McQueen gown from the diplomatic reception. It is beautiful, and very much a gown fit for a princess. How incredible does the Cambridge Lovers Knot Tiara look? Click play below or visit the Mirror to view the video. The quotes released offer a fantastic insight and will be an excellent opportunity to see another side of Kate's personality. It sounds like it's quite a candid interview and promises to have a number of memorable quotes. For our readers across the pond, the documentary will almost certainly be available on YouTube shortly after it airs, and we will provide any and all available links in our post on the night. I'm very much looking forward to seeing it in its entirety. What a wonderful cause! I always love seeing Kate interact with children. On the sartorial front, I've never really loved this coat, but I don't hate it either. It does look like it doesn't quite fit--perhaps the pulling is just from getting out the car and being disheveled? I'm in no way saying Kate needs to lose weight (heaven knows she's absolutely tiny)--I imagine it's mostly the design and material--but this coat didn't look well suited to an event that involved a lot of squatting and bending. I think it was due to getting out of the car. If you look in the other pictures where she is standing up later in the engagement, the coat hangs fine and looks like it still has a nice fit. It's probably due to her sitting down in the car for a while. It temporarily changed the form of the coat because the material holds shape for a while. Thanks for the history and information on all the charities you mention on your blog and a huge thank you for providing links for donations and links for volunteering. Thank You Charlotte. As always lovely to pop in here. I've always liked this coat, but for some reason it seems more plain than usual (maybe lack of hate or statement earrings). Would love to see it paired with a non-blue dress to give it a different feel. As always, Kate looked so happy to be supporting one of her favorite charities. I love how she made a purchase. I'm sure the woman behind the counter was quite nervous to complete transaction! Lack of hate? :P Hahha, I assume that was meant to be hat :P And I agree. But it didn't matter really. And another thing I thought about. This is a street where she goes shopping as a "private person" so maybe she purposefully didn't want to go too much "full on princess" because they seem to keep a distinction between private and public selves, and here she had to be her public self in her "private sphere". Just a thought I had. I thought the same on the engagement in Anglesey. Oh goodness, yes! Hat! And that's a great observation about her personal shopping trips. Good thinking Rebecca. :) I think you are right about that. Wow, you all really do spend a lot of time overthinking the choices Kate makes. She very rarely goes "full on princess" regardless of where she is or what she's doing, and she pretty much wore her standard working day uniform today as per usual: dress that isn't seen, coat that stays on, plain pumps, small earrings, one of two or three clutches. This event was no different than any other event she's done in the last year except for the state dinners, balls, etc. Well, thank you anon for telling me what I should spend time on and not. How nice of you to inform me. I never said I knew the truth, just specualated out loud. Geesh. I don't mind this coat though it's not my favourite. Labelo is right. This coat doesn't look good when stooping and bending. Nothing with perpendicular detailing will unless the wearer is standing ramrod straight. The plumb line is off as soon as someone moves.That's why the Japanese don't value hourglass shapes in women as we in the West do. It makes kimonos look bad. Japanese women pad their bodies under the kimono to create a straight line. Let's also not forget that such clothes photographed on a person in motion--especially bending over--will never look quite the same as the same items on a posed photo shoot. Those are pinned and tucked and all gaps or wrinkles removed until perfect as the shoot progresses. Then they are photo shopped. When people slouch ever so slightly (as the Duchess, like so many of us, does), nothing will "fix" the tailoring of such a garment. It's something to remember when we are critical of Catherine's clothing choices. But it's also noteworthy that this kind of "problem" could be addressed by a stylist and/or better posture. I think she looks gorgeous today! Radiant. Charlotte I couldn't agree more with your comments. It might be "just" a ribbon cutting, but this event absolutely illustrates why they are so important. Hopefully Kate (and William, etc.) will see the wonderful coverage of this and start to understand that. What a great day for Kate. That looks like such an adorable little shop! I have always loved this coat! And love the beautiful blue of the dress underneath. Great cause, great look (her hair also looks amazing! ), great day! How sweet! I love to see Kate with children, she seems so kind-hearted (and I'm sure she is)! I like this coat, this is a beautiful choice and it's interesting to see her recycling "old" pieces and mixing high street with designers. I was wondering... if Kate bought some pieces for George and Charlotte, is she allowed to take cash with her? I read somewhere that the royals can't do that...? I believe some of the royal-cash business came from the days where money transaction were seen as not quite the thing - merchants would send accounts and bills paid at home. The church collection was an exception. This is before the day of credit cards and such, so it is rather outdated - and I don't think royals follow it anymore - although they aren't going to go around like those people in the Times - saying how much money they are carrying with them either. I'm sure in this case, it was a planned part of the engagement. Can't have Kate being like Julia, turning plaintively to Mr Leo after finding she has used up her last ten, saying "Darling, do you have any money..."
All too often, fortunately Mr Leo almost always comes through. I always say I shall pay him back which is utter nonsense because we've been married thirty years, keep nothing separate and I've never paid him a pence back - I suppose it goes back to before we were married when I really meant to do it, and I simply got in the habit of saying it. Heaven knows what I owe him now! She certainly is "helping in any way she can." Dear girl. You go girl. perhaps not "in any way". lol, I know 19:15. (Actually, I was being facetious.) Love your editorial. Thank you Charlotte for your speedy posts and thorough coverage on the event and Kate. This is was an incredibly special event. You can really tell how all involved really lit up as Kate participated (her included). I thought it was a nice touch that she herself bought a gift for George and Charlotte while she was there. Very thoughtful and very much in line with who she is. I agree, that this type of engagement that involves ribbon cutting is absolutely a valuable engagement to spend your time doing. I can see why they want to do more engagements with substance but I agree that they can't rule this type of engagement out either. On to the clothes, I have always liked this coat and dress. I actually have a repli-Kate version of the dress from Calvin Klein. I think she looks pretty as always and I like her new shoes. I have to go over to Kate's Clothes website and see how many pairs of blue suede shoes she owns now. She has quite a collection and I always find that navy blue shoes are harder to find than black or brown. At least in my experience here in the states. So fun to pop in here and see a wonderful unexpected post!! It is a wonderful charity - thank you for your write-up on it Charlotte, and thank you to all the wonderful volunteers who set the shop up and run it, and for all those who do that at shops all over. I always try to buy from charity shops when I can and my mother volunteered in one. On that subject - for those who read the Royal Musings - I would urge you to read the Wiki article about Princess Mary - we don't know why she missed some dates with the Guards but we DO know she was a hands-on princess who took a nursing degree and worked in a hospital two days a week for a time - while still carrying out royal duties and raising enormous sums for the forces during World War I. (She was active with the Guides and the Red Cross among other charities) On the Wiki article, there is even a link with the Middletons. I do believe in moving on. I understand Kate has told us not to expect to see her for the next month as she gets ready for her five day tour - but perhaps there will be a change - if not, I'll look forward to India. I doubt that Kate believes in volunteering an hour or two of her time. This engagement lasted 35 minutes according to sources in Norfolk on Twitter. Seems a bit much to have an entire month off for a 5 day trip, but I imagine a lot of planning goes into it all. I read that article on Royal Musings, and I must say I was shocked by the tone of it. I had a different expression of Marlene up until now. I hope she gives a second thought to publish similar next time. I am not questioning what she writes but how. As far as we know Kate has no engagements until the tour. No expectations of any anyway. 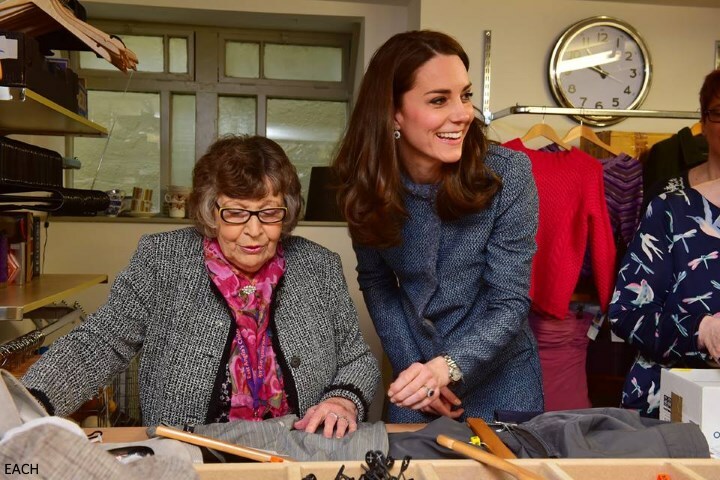 Julia, LOVE your suggestion that Kate volunteer in the shop since she frequents that area anyway for her own shopping. If she had George in pre-school at a public place in Norfolk, she could also volunteer some time at that shop. That would really boost the shop's profile. (Wait a minute, why am I even expounding on this. While it is a good thought, of course that would never happen. hello. nice place to visit, but she would never work there.) Good thought though Julia. I think Marlene(royalmusing) and others confused the word "traditionally" with the word "exclusively". Also Marlene has a bit of a history with Emily so I would take this particular post with a grain of salt, her research notwithstanding. I also think it doesn't really matter in the end who honored the Guards before Kate, fact is she's taken it on since her wedding and it has become a tradition for her. I could have fallen in with one of royalfan's frequent theories, that maybe she was asked to step aside this year to allow William to shine for example, if it wasn't for the follow-up comment! But when KP added "they wanted to get away from the expectation that she'd do it every year" and when aides said "she did not want the public to think she was taking on the responsibility annually" that spoke volumes, and came across as a bit of a kick in the teeth in my opinion. Hopefully Kate and company will recognize that as well. KP did say though that we wouldn't see much more of her pre-tour. On today's event, I am one who has always been somewhat offended by the term "ribbon cutting" and William seeing it as dull. As was clearly evident today, what can be mundane for a royal is quite exciting for the charity and members of the public. I think Diana would be the first to remind them, "It's not all about you!" So yes, I hope they start doing much more of them, easy way to get out and about. And lastly, I happened to be online when the KP statement on St. Patrick's Day came out, and of course Charlotte had already updated her post! But she kept updating frequently for about an hour so those of us commenting were able to have a "live chat", in a way! So Charlotte, Yankee, Rebecca, a few Anons and others, just wanted to say I very much enjoyed the "real time" conversation, or as close to it as we could get! Thank you. So we can expect four-week holiday kind of. But it must be lot of work to put together her wardrobe. Thanks Claudia for the background info on Marlene-Emily thingie. Claudia, I'm really sorry that KP made that statement. It was worded poorly, and nothing short of opening a can of worms. Her appearance was not set in stone, it was simply an assumption (hope) on our parts. I'm not aware of other royals' non-attendance being announced or explained. It probably does take some effort to put together a wardrobe for India, but she has had months and months to work on it and I doubt that she will be spending all of the coming four weeks putting together her wardrobe. That wouldn't be spending much time with the children. She said that is why she was absent yesterday. She said she wanted to spend time with the children. I think she gets to spend a lot of time with her children and she has a nanny to help her spend time with her children. I am sure the wardrobe for India will be completed, if it isn't already complete though, as she has helpers for that also. Marlene has a somewhat abrasive personality, but she is a professional and facts are facts. I am glad for her research. It throws light on the history of the shamrocks events. The newspaper commentators should be so thorough. I can see the Queen Mum and Princess Mary have a good chinwag up in the beyond with the Queen Mum saying "now Mary, what were you doing in 1931 when you didn't hand out shamrocks?" and Mary replying -"Goodness, Elizabeth, I haven't the least notion - you don't suppose that's when Harewood and I were on that tour of India...who is this Marlene person anyway - and how dare she use me as som example without checking first..."
Sure would like to know where people got the idea that Kate "said" that she will not be seen until the tour. I have read everything written and there is nothing saying that she stated she will not do any more engagements until the tour. People just writing crap again. It was in one of the articles - I don't recall which one - under the same idea that she was going to "focus on her children" in the weeks before the tour - it stated that she was not going to be doing any engagements - and of course none are scheduled at this time. It is most certainly not people "writing crap" this idea of focusing on the children comes directly from Kensington Palace. Whether she in fact does do any remains to be seen - I rather hope so. Royalfan my impression is that the KP offices are on a very tight leash and nothing is said or conveyed without the bosses approval. I think a lot of people realize that as well and that's why the statement was stunning and even upsetting to some fans, most think it's probably an accurate reflection of how Kate/William feel. There seems to be a taste of "ugh, why do we have to do this?" Also Anon, when the KP statement came out every royal correspondent quoted an aide or source who said "her focus now before the tour will be on her family so don't expect to see much of her in next few weeks." She's going to India for one week. One week! It's not like she's going for weeks on end. How long could it possibly take to organize clothes for a week's vacation even if you are the DoC...and especially if you are the DoC since she has people who organize her clothes for her? Many of the commenters on this blog will rush to defend Kate saying that it's a long time to plan for when you have to meet so many people. But not to work for a *month* to get ready for a one week trip? It seems to be yet another excuse of Kate's to shirk work. I'm not British but, were I, I would absolutely feel she continues taking advantage of her position while continuing to receive public funding. Some here have said "surprising", but I would say her behavior is "offensive". It can be very hard to tell how things will be interpreted when you are close to them - the important thing is to recognise that and get other opinions. As for not saying anything, because the Queen Mum was so faithful about that engagement right up to the end (and those lovely wolfhounds make it such a noticable engagement) and few of us go back as far as Princess Mary - who may have been seen as quite faithful too - hard to tell from a few clippings - the expectation was there. But things could have gone much more smoothly with some more tactful and graceful wording and not making what seemed to have been their intentions about expectations so obvious. Don't talk about the future - don't say, well, William's the colonel so that's all right then - when royal ladies have been doing it for decadss - just say how terribly sorry Kate is that she can't make it due to obligations relating to the coming tour and how she will miss seeing the Guards and looks forward to it in the future. Not perfect, but certainly much better. The "Her focus now before the tour will be on her family..." part makes sense and is consistent with the type of statements made on behalf of the royals. The "...so don't expect to see much of her in next few weeks" part seems like a bit of sarcastic editing which, unfortunately, has had the desired effect. Anonymous 1:22 here's a link from Vanity Fair. http://www.vanityfair.com/style/2016/03/kate-middleton-charity-shop-missoni-coat It quotes the "spending as much time as she can with her children" and the title of the article is "Kate Middleton (sic) makes her last Scheduled Appearance before her upcoming India Trip." It's a sarcastic article but it quotes People as a source. That's not where I orginally saw it - it was one of the British paper sites - which is undoubtably where People got it. That paper had a paraphased quote from a source indicating Kate planned to do no more appearances before the tour but to focus on her children. It had a more respectful tone but I can't remember which site it was. No saying if this is so, but it is not just "people writing crap" either (unless you mean the magazine which might have some justification!) and if you have read everything, you must have seen this - I found it just by chance looking for something else - but the same thing has been in multiple sources. I will be delighted if it's wrong but it is consistant with the original announcments. Things do change though. I think the last part was maybe said "in jest" or as an off the cuff remark royalfan, that looks very differently printed in black and white than spoken in a pleasant conversation over the phone. I doubt it was editing because the same phrase appeared in numerous articles by different reporters. The correspondents are likely calling the KP reps almost daily, looking for any updates, any changes in calendar, running stories/reports/rumors by them. So I can see someone saying "her focus is on her family for a few weeks now" and then adding, off the cuff perhaps, "so don't expect to see much of her!" Almost like a "you can stop calling me" jab.. does that make sense? Again, not a smart aside and shows the need for maybe more mature, seasoned people at the helm, who recognize every word they say will be taken and repeated. She looks lovely, as usual, but this coat and dress (I know because I own the dress) are really not suitable for bending. You can feel from the way she got out of the car. Lovely color on her though. It's nice to have reliable staples in your closet. After the last couple of days, ALL I can say is well done. That is exactly royals need and have to do. I wholeheartedly agree with you Charlotte on ribbon-cutting, personally I could never get bored with it, I know many discussed this here too. I think it is a nice way to show support to the public especially in case of hospices. Thanks for the post and I could hardly wait Easter to come and see the documentary. I hope Kate will utter more than 2 nice words about the Queen. On fashion front, I loved this coat, but I found nothing to care about this look. Lovely springtime weekend to all! Anett, I think Kate looks totally like Kate in that photo. "Up to something". Damage control, perhaps? lol, Anett @ 18:28. No. You said that Kate looked like "she might be up to something cheeky". I said that that "something cheeky" might have had something to do with her wanting to do some damage control regarding what happened yesterday. Damage control like stepping up the charm a little more than usual today or something of that nature. Do you understand better now? I think there was a slight miscommunication there somehow. I wasn't criticizing you. And I didn't think you were critisizing me:-) Don't worry. Good cause but managed to grab the haedlines for not turning up toe the event yesterday. Looks good but perhaps the headline is too short for a cold day in my opinion. Ohhh this is one of the pieces from the Duchess' wardrobe that I just drool over! I would love to have it!! I agree that it's not the best fit for an event where she is bending down a lot to engage with children--it looks quite stiff and uncomfortable, but I think she wears it beautifully! Missed her so much at St. Patrick's day yesterday, and can't help but feel disappointed that she didn't attend. You and thousands of others, at least, 16:05. I love to see how she is interact with peoples, but i hope she not recycle her dress many times. Maks 3 times is enough. Why? Why is there a special number of repeats allowed? :P I mean, if this had been within half a year I MIGHT have agreed with you. But this is 4 times (3 official, 1 Private) that we have seen her in the coat in 4 years or so. Because, Rebecca, Anon 16:07 feels like three is enough. Why should she have to explain why? It's okay for her to have her own opinion and not be wrong. Yes, ofc Anon 04.22. I didn't mean the persons view is not valid. Just the "3 times is enough" comment seem a bit odd so I was more wondering where the levels go of too much wearing and is that depandant on how close or for how long it has been worn. Didn't like the coat. Think it needs to be retired. She looks pale and a little tired. Cute photo of her consoling girl with ponytail. In other photos looks a little strained. Loved your comment Julia, as usual. I would look pale and strained too after the near public execution of her soul yesterday. It was brutal. But with that said I think she has looked a tad pale lately. Maybe she is not feeling well herself. I am sure George has brought home some colds etc. All kids do. Hoping the India/Bhutan tour will be colourful and fun! Execution of her soul? I wonder how the soul of the Irish Guards felt after being stood up because she doesn't want to create an expectation that she will participate in their most important ceremonial event of the year every year? I wasn't going to bring it up, but seeing as you had to create such a hyperbolic start to your comment I'm happy to weigh in. Whether you like it or not, Kate -- as a member of the royal family and a senior member at that -- does have an obligation to the public. She let that obligation down yesterday and she should be chastised for it. I'll spare you the history lecture about what happens to kings and queens when they forget that very salient fact. Well written bluhare as always. I think it speaks volume that even Julia had that reaction. I also must confess but it agrees with her, style, wording,sharp thoughts. I hope she won't mind me saying this. It was in gist Bluehare. I thought I put quotation marks around the soul part. Forgive me. Not going to dredge it up just thought some remarks were terribly brutal and personal. That is all. "execution of her soul"? IMO, if that was done, Kate did it herself. Thanks Bluhare for coming to bat on that one. And I agree, that Julia was very articulate and reasonable in her defense of her reaction to Kate's decision. She made perfect sense to me. Wise lady. Don't mind at all but since I would rather be proactive than rant - here are my suggestions for William and Kate - none of which they will probably take - or even know about. 1. Make your peace with the established press. Battling them just leaves everyone bloody and does no good. Give them a lovely photo opportunity with the children just before you leave for India - a natural time - that doesn't lead to holiday expectations (that dreaded word!) Remember when you are sixty, there will be no photographers when you want them - as father Charles would admit if he was honest. 2. If you don't sack him/her, never let that person who wrote that "Kate has enjoyed.." bit loose with comments again. If Julia had gotten that from her recent houseguests "enjoyed it, must do it again, but not every year.." she would have wondered if it was the stroganoff or if the house smelled too much of dog. That comment should have expressed regret, good wishes to the guards, and gravitis. All comments should be run by multiple people - preferably from different walks of life who can be honest and trusted. I wasn't the only one to notice something was wrong with that comment - if we notice - it could have been easily corrected and created a much different impression. And even if more was sent to the guards - the public needed a better response too. 3. Tradition is the bedrock of the monarchy - particularly for those who let the monarchy run mostly in the background - innovation should come slowly - and be productive to the monarchy and public - not to individuals. Correct this - attend Easter at Windsor, attend the Scottish Games, show tradition is valuable, even as you innovate. 4. Make your peace with the Irish Guards - whether they care or not - the forces is one area where the public cares enormously - negative comments yesterday ranged far beyond the usual complainers. There was an awards event the June of 2011 - maybe there is something similar this June. Kate - Be there in a new outfit - glowing with pride at the regiment. 5. The mental health scheme is a brilliant one - but expand it to be broader and cover more - the elderly is a huge area - depression and loss are major issues there - often for people who never suffered problems before. And make sure engagements are broad and cover many areas of the country - overseas tours are lovely but there has been too little at home. Caring for wildlife is wonderful but again - it is an international issue. 6. Remember for every tree planted and ribbon cut there are people behind it - never slight it or trivialise it. 7. My favourite engagements have been unique ones - Kate pregnant, in the snow with the other Guide leaders - just one of them 0 not a staged situation- William and Harry helping with the floods. I was only having joking about spending an occasional hour volunteering. That's one of the major problems with the helicopter job - this sort of thing is outside public view - and the public needs a view - they want to know what their future king is like. Helping with the flood is worth a thousand times more than any helicopter flight -yet there was none of that this year. Surprise people - in a good way. That's why Diana was loved. 8. Remember what my father said - two jobs generally means doing both not as well as you should - consider making royal life your full-time job - with time for family, of course. 9. Accept expectations will be made of you. Honestly, William and Kate! All your subjects face expectations every day. An occasion event is not asking too much of you. Do things right and you won't have to attend every year but the idea you don't want to should never be out there. Horrible! All very good points Julia without being condecending or mean! THank you! Rebecca, I would like to point out that condescending and mean is a two way street. How many times have I seen on here from fans (before anything critical has been written) "take that, naysayers! ", "ha, haters! ", then people going nuts and being quite rude because they disagree, and things like that? Answer: A lot. I think I react more strongly sometimes anticipating a response from one of the uberfants (typo and it stays) because, frankly, that's what I usually get. I've written posts that aren't personal, stick to my opinion without making any comments about people who disagree with me, and I still get launched at fairly frequently, although I do think Maggie has taken up the mantle on that recently. So perhaps some of the fans could learn the same lesson. I like to have fun online, and I think you do too. It's hard to do here because people take it all so seriously, and the prevailing attitude is "you're either with us or against us". Actually no. I'm not with you, but I'm not against you either, and there's not much tolerance for that. Am I diplomatic like Julia and Claudia? No, I'm not. I've always been told I tend to call a spade a shovel. But neither am I rude and petty like some of the regulars (most of them anonymous) here. Everything this week reminded me of something Tina Brown said about Diana. She said "Diana told me she understood one thing more than any other, the only real power the monarchy had left was the power to disappoint"
It came to mind again after I read Erika's comment in the last post, and Erika what you said really struck me I have to say, and is more than understandable. Diana understood you have to always show up in royal life, looking every inch the part, and act like every engagement is the most important engagement. I can imagine her saying "it's not what's convenient for you, it's what's important to THEM!" It's not a job of prestige, it's a job of service. You should always be looking to do more, to connect more... not less. Wonderful charity highlighted by the Duchess. Lovely morning seems to have been had by all. The Duchess is tremendous with children and after all they are the future citizens that William will reign over. There is a great video with her and a child with epilepsy leading her around the store. Well done Kate. That video was super sweet. You could clearly tell how drawn the girl was to Kate :) Very nice! Did she get there by helicopter? Does anyone know? lol, 18:10. Don't know if she flew in in the helicopter. It's only a short drive from her home. Highly doubt it since it's only 40 minutes from their house and she's been seen there shopping from time to time. "Hopefully they won't "expect" another visit. (Just kidding also.)" I am sorry Anett. I don't know what you mean. Love her hair--looks like she got a trim. Love her trying on the hat, etc. Wish there was an EACH store closer to the London area (if we get to visit in a few years, I'd definitely stop in but all the shops are on the East side--obviously East Anglia). Spreading out a little further would get visitors like myself to pop in (time is short and EA is not in the plans). There are other hospice/children's hospice shops in the London area: my suggestion is to pop in and support them! It doesn't need to be an 'EACH' shop. I don't like this look. It seems as if she threw it together really quickly. I am a huge fan of the Duchess and am usually frustrated with people who complain but this is way too low key even for me. It's March in England, we need color! There she is ! I am so happy Catherine wore this lovely coat I like so much ! we are back to the youg and charming feeling she gave to us one or two years ago ! regarding the fitting when she bends , it could be easily solved by a few small patches of "scratch" ribbon, holding the two parts of the coat together. and for the cutting of the ribbon .... it is so symbolic (as are the shamrocks ... !) and we do need symbols like that ! great idea of Julia of Leominster, Catherine volonturing a few hours in the shop ... I am sure the security officers could manage that ! and it would be so wonderfull for the other volonteers !!! Kate volunteering in the shop could go a looong way to offset yesterday. Not totally, but it would help. I love it when Kate (and the Princes) support causes such as EACH. It's wonderful to see. Hopefully it results in great things for all. As always, thanks Charlotte for the post. I'm getting excited for the India trip. I remember when they were off to Australia and New Zealand you literally turned your nights and days around in order to provide up to the minute information. Now to her choices of the day. I have never like this coat. Sorry. It reminds me of something a little old lady might wear to church on Sunday. I would love to see her wear something a bit brighter when going places where she will be interacting with so many children. But, she can simply pull anything off and she looked great today. I love to see the photos like the one of the Duchess trying on the hat. That look of glee on her face was genuine for sure. I read that she handed the clerk a ten pound note. Wow, tough crowd here! I thought she looked great. This is one of my favorite coats. I just love that picture of her with Rebekah. She looks so engaged. So cute that she bought some things for George and Charlotte. Cannot WAIT for the interview! Thanks for the post, Charlotte. Is it possible clothing that is so expensive, and well cared for, could become ratty? This coat looks to me like it has seen its better days. Could just be the quality of the pictures. When she first wore it I loved it and I still think it makes for a striking silhouette. Definitely a "ho hum" outfit put together today. Recycling is grand, but we have seen the coat too often and frankly it is looking a bit short for her age now. Retire it to the closet, mark when and where you last wore it, and don't bring it out again for a nice period of time. Kate needs a stylist to assist her with putting together fresh and appropriate outfits for her engagements - and they do not necessarily need to be expensive. Have a lovely weekend everyone! She was opening a charity shop. She has no need for a stylist. Her judgment here was on the money and respectful of what the occasion called for. I think the stylist was being suggested to help her manage repeats better. There couldn't BE a more appropriate place to wear a repeat: a thrift shop! 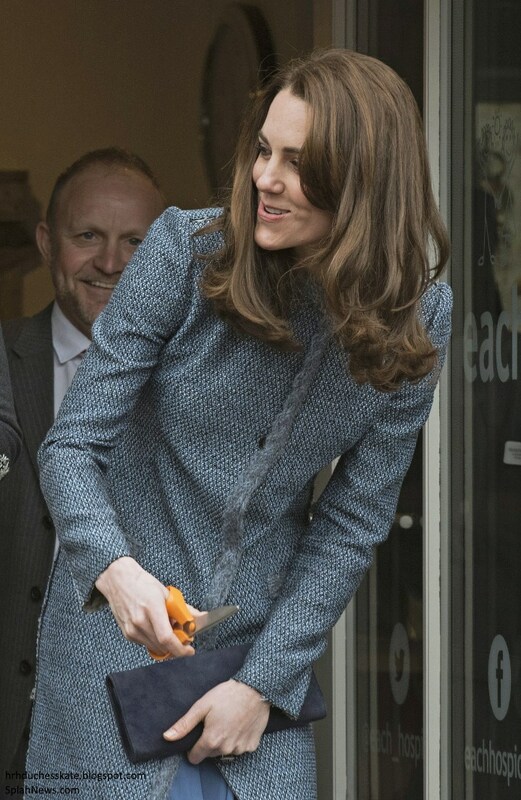 I do not think it is a coicedence that she is wearing a re re re cycle coat to open a charity shop. It would have been very insensible to wear a bramd new or quite new coat to an event which celebrates the value of older and used clothes. I like the coat btw. Kate bidding farewell to NZ with PW holding PG is an iconic pic for me in which ahe looks beyond beautiful and beyond happy. This is true and it's one perspective - but it's also worth remembering the Queen Mother's statement that she put on her best when visiting the bombed out East End - "because they would do the same for me." That still applies. Diana was also the master of balancing repeats. I think some repeating is a good thing but for whatever reaon, that coat is starting to look a little tired - it may be the knit. Striking some variation in a repeat outfit - different shoes for instance (interesting ones) shows caring. The vital thing is to make each engagement - large or small - seem as if they were the most important one you ever did - because to the people there - it is the event of a lifetime. Someone commented that Kate shouldn't be compared to the Queen Mum or Diana and to some extent, that's true, you chart your own course. But you also learn from masters, and a royal lady can learn much from looking at two of the most successful royal ladies ever. When there's talk "we don't want another Diana" that's the royal establishment speaking, not the public. Most of the public would love another Diana - without the scandals and tragedy. Her warmth is craved and that's why people are drawn to Harry who reflects that kind of spontaneous warmth and thus gets forgiven for things William doesn't. I fully believe Kate can do this too - but every wonderful scene with a child is going to be negated by any feeling she would rather not be doing this - and that's where she isn't there yet. There is an uncomfortable feeling she is grudging the time for every engagement - even before yesterday's muddle - and that's where care needs to be taken and why this "we're only part-time royals because someday we're going to have to do all this boring stuff so we're living our lives the way we want to first" is so dangerously wrong - and lingers in the background of every great mental health engagement, every dazzling appearance. I think they are really going to have to learn to believe in royal life to make a long-term success of it - and they owe that more to George and Charlotte than any fun at the playground, or hour at home - it is their future. I'd agree with the re re re cycle thing if she wasn't wearing Prada shoes. I think the coat looks worn, look at the previous pictures, Kate and the coat look much more "bright" and polished. This seemed a little thrown together, as if she knew it was a quick thing and didn't put a lot of effort into it. People stand in the rain to see the royals, they need to look the part. Loved this post. Kate is terrific with children, and they all were so excited to see her, and be in her presence. While I agree with those of you who suggested she volunteer weekly, I wonder about security and if she wouldn't be a target, and thus put everyone in harms way. Her handlers would probably veto this, as you want to avoid predicable patterns for anyone in her position. I'm sorry that the world is like that. Thanks Charlotte for a great post. I do agree on the security concern. Not fun or so easy being in her pumps. ;) And I give her a lot of credit for going about her business with grace, dignity, and a smile on her face. If it was done on a sporatic basis - not a regualar schedule - it would be brilliant - and avoid the security and the mobbing the shop issues - even if she just did it for a few times - it would do enormous good - it can be done if someone has the will to do it. And doing volunteer work with other volunteers is so much better than getting mixed with people who are trying to make a career of something - it avoids that sort of "taking a month off" resentment -and at the same time, as she did with the guides - give a huge boost to volunteering at a time - when so many people have jobs and limits on their time - finding volunteers has become more and more difficult. She and William go out for dinners and lunches unannounced. She could do the volunteering the same way. They do go out to eat a lot really. No problem. and those are only the times we know about. Kate could let the shop manager know, and no one else, cand just stop in and volunteer for an hour or so. Why would that be different than going out to dinner or lunch, or a playground? There are multiple shops in the region too - it doesn't have to be Holt. Just pick one - talk about putting those ladies in a flutter - the good will would be enormous. Given that they do go shopping, out to dinner, to the playground and those are in public, I think Kate could just as easily volunteer at that shop for an hour so, should choose to. Perhaps giving some of her clothes to auction might be more productive and expedient though. Auctioning some of her old gowns, coats, and even those beige sledge pumps, etc. would be such a good Idea. She could hold a general auction and then divide the proceeds among her various children's charities. How lovely Kate looks! I love that she re-wears a lot of her outfits. it makes her more "real"...she has favourite go-to items that all look fantastic and she is sensitive to the occasion. Her interactions with the children are beautiful, she absolutely shines. I may be in the minority, but I've always liked this coat. Kate looked lovely and appeared to be in good spirits, despite the heaps of criticisms she has faced lately. I hope she had the shop put aside that darling hat. It looked fabulous on her. Yes, it did. :) The hat looked very similar to one she wore back in her single days. The perfect antidote for anticipated bad media. the following day. Perhaps her PR team has gotten one thing right. That is really probably true 22:48. My guess and it is only a guess is that it was a logistical thing of Kate wanting to be back in Norfolk coupled with the fact that William and Kate did want to get rid of the expectation she would attemd every year - and thought the next day engagement would balance it. And that was not good PR really - but yesterday's engagement did help and the press is partially responsible for that. People here and elsewhere spread much blame on the press - but I actually think the press was a little frightened at the vehemence of the public response - many reasons for that response but mainly people are hugely sensitive when it comes to the forces - in any event, the press moved to protray this engagement today very favourably. As indeed it should have been, but lately that has not always been a given in the press. to be right after the St.Patricks Day event or would Becca and Becca's assistant have scheduled those? I agree about the press, some of the royal correspondents said publicly that the strong responses they were getting to the KP statement quite surprised them. Most of them believe this has been building, they've said they first noticed more grumbling from the public after the KP letter on photographs. I think memories of Diana are fresh in the minds of many Brits, so people were prepared to give William and his new family a lot of rope so to speak. But there was a definite change then, a sense of "we're giving you space, we're giving you all the perks, everything you could want, don't start complaining!" Not looking to get into the photo debate! Just pointing out that some discontent and questioning by the public has been building for some time, long before the Sun's "throne idle" splash. I spotted the new shoe right away, so hooray for that! However, this coat is a little short on Kate. Actually this coat cries out for a pair of nice black pants underneath. Would have solved the problem of the awkward bending over. Interesting reverse seams down the back of that coat. But again, no fastener near the waist! She was only at the charity open house 35 minutes? With all the photos it appeared more. I have heard that it is only a 40 minute drive from Amber Hall to the Charity House. I also heard she had planned to use the helicopter. Does anyone have any confirmed news on that? They drove. No reason to fly. That is just not true. It's 40 minutes away and she shops in Holt all the time. Any comments about a helicopter are incorrect. Yes DB. And any comments that may have been printed about the helicopter are very obvious attempts at pot stirring. Thanks, Diane. How do you know that? Any links to share? Thank you Charlotte for the,as always, informative, well researched post. What a wonderful and worthwhile organisation this is. I would hope that everyone on this site at least visits their online shop for a look and if possible a purchase. I would also hope that the organisation has considered creating a tour sheet of all their shops to be given to various tourist organisations for visitors to the UK and the area as an interest much like people do garden tours etc. I was saddened that wheelchair-bound Jill Carrette was upset and very pleased there was a good resolution. The choice of dress was so appropriate, a well recycled coat with a slightly retro feel. And although I love fashion and love to see new and different I do think the event is more important than the individual and that the choice of clothing should enhance the event as someone above highlighted that it did today. I thought this was a good event and that the Duchess looked happy and that she engaged well with all the people there. I agree with Tedi that the security risk of a regular volunteering would be a problem perhaps there may be an impromptu drop in as the Queen Mother did on occasion. Let us wait and see. Dare I say it she did set up the expectation that she would be returning! Rather than volunteer and work there, which as mentioned, would be a nightmare for the security, she could instead donate some items of clothing..... Just a suggestion if anyone from her team does read this blog!!! Erin, THAT is an excellent plan. That is perfect. Becca, did you get that? Although if the charity auctioned her stuff they might get more money. A link to a preview of the documentary and a screenshot of THAT McQueen dress worn to the Diplomatic Reception added. Thank you Charlotte for updating the post with the details from the interview. I am so glad that we finally got a better look at the dress from the diplomatic reception. That was definitely a nice treat and surprise. Do you know if the special on the Queen's 90th will air in the U.S.? 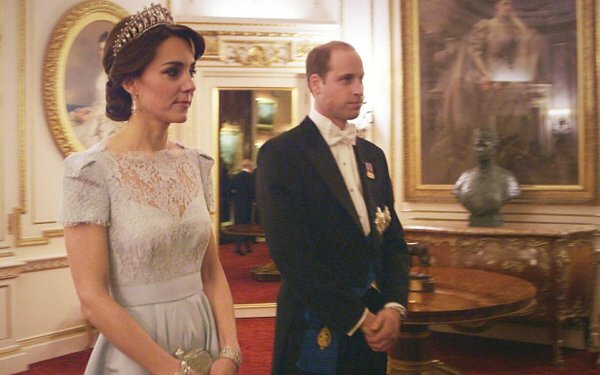 Diana's tiara looked beautiful with the gown Kate wore to the diplomatic reception. She seemed to be wearing two diamond bracelets (one on each wrist). My guess is that one of them is the diamond bracelet that Charles is said to have given her. In the excerpt of her Interview at KP, I couldn't understand what she said right before she said that George is 2 1/2 and he calls her gan gan. Does anyone know what that "lost" sentence is? And they had the background blurred so no one could see the decor. It looked like a baby grand piano near her. "I think she's very fond of Charlotte, always watching what she's up to." That documentary timing is very good - at a time when William and Kate need a boost - and if I wish the queen would give a little more guidence than what Kate suggests - a little more iron fist in a velvet glove - that would have helped avoid weeks like this - and that she has been perhaps too generous too soon, as well - I'm too thrilled to see a full picture of Kate's gown to care too much - shows what a dazzling gown and a tiara can do even to the cynical among us. Worth noting that from the royal photo watcher at the queen's audiences, that William and Kate's photo was not visible this week - perhaps a hint that the queen didn't completely approve of this decision of theirs - instead the photos shown were on the other side of the fireplace - a black and white and a colour snap of men in uniforms - Andrew? There is really no way of knowing if the past week would have happened if the queen had taken a firmer stance. It's purely supposition to fit the theory. There is also no way of knowing what advice is given or not given by the queen and what is taken or not taken. I think we should enjoy the documentary without too much analysis, in celebration of wonderful life of giving. Each of us can see it in our own way. I think Kate spoke beautifully - waiting on Mr Leo awaking to get a full screen view as my computer is not cooperating - but I'm not going to brush off issues that concern me for a pretty blue gown - and nothing to do with honouring the queen whose work is completely serparate - I will say it disturbed me to hear Kate say she has been teased over taking too much time with the public - at a time when it has been noted that she can seem too reserved, including in the press. I simply hope that she will cease to worry in that regard about what others think - slightly contrary to my overall opinion that more guidence might have prevented some of the bad feeling this week. As to what advice the queen gives, we now have kate's own words - which matches what I have long believed - that the queen mostly lets her family chart their own courses. As to the photos it seems they are rotated as I have been reading on several sites that the pictures seem to be changing more frequently. I think it is a big leap to assume that no pictures of the Cambridges means they are on the 'outs'. I would not expect the Queen to be so shady or use removal of pictures as a sign that the masses can dissect. Can we pleaset STOP reading into every single change or event or half truths? It's really so exhausting. I don't think the Queen says to the staff... bad William and bad Kate...take those pictures down now so I can show thwith world that I am not happy... Bloody hell. Doubtful. Well she does say gentle guidance, so maybe not as uncharted as suspected. I didn't appreciate your language in the last paragraph. That is worse than what you were criticizing. I don't think this is just a maid casually dusting or a flower person shifting photos around - but I don't think the queen is saying let's banish William and Kate either - I do think someone close to her does a subtle tweaking for whatever the queen's intent may be. But it is worth remembering that symbolism is a big part of how the royals communicate with us "masses" -and it always has been. And interpreting those symbols has always been part of the public's relationship with the royals. Exhausting perhaps, but nothing new and some of us who have been watching royals for decades may be more attuned to the placement of china corgis at Balmoral than we are the dog figurines in our own sitting room - whether we mean to be or not. Julia, I was quite surprised too that Kate is being teased for taking too much time at walk abouts. That makes me a bit sad as I think that would be part of the engagement that can be the most flexible and allow for more time if needed. If she needs to learn more maybe she could DO more? What a concept. She's not going to learn much laying low in Norfolk. Yes she said some nice things, so did Andrew. Doesn't change my mind on him. And can someone please tell me what sort of accent she's going for? Someone? Anyone? Was that the same accent she had in the engagement Interview (no) or when she was conversing in the video in Holt yesterday (no), or the videos she has taped for the charities (close, but no). She wasn't at ease in the Queen's video. Not at all. She kept kind of fading off in her words and her accent was so thick you could hardly understand her. It wasn't clear in the excerpt whether she really has a close, warm relationship with the Queen or not. Surely since she has been in the family for over five years she has a more recent recollection of a good time spent with the Queen than the one she referred to. and "natural" like some are saying. Not blaming her. I would have probably given the same information and been safely selective in every thing I "shared" about the Queen. It is nice to find out even the safely selective tidbits. It was nice to get a look at her gown. I hope Kate will be brave enough as time goes by to really be herself more. Like with the banter while ascending and descending those walls (remember the funny face she made as she was at the top of that 40 ft. descent.) I think she is a very sweet person with a great personality and a great sense of humor, a very funny and fun person. Perhaps a video of the Queen is not the place to let your hair down and she didn't. Thank you, Charlotte, for the pictures and clip from the 90th birthday interview. Kate looked very beautiful for the diplomatic reception in her beautiful gown and the lover's knot tiara. I believe she was wearing Queen Mary's bracelet on her left wrist. I wish I could see the one on her right wrist. Her words about the Queen are very special. I wonder whether she comments at all about the Chinese state banquet. The gown was pretty and the tiara, of course, beautiful also, and she wore Diana's tiara. How special is that. Didn't think she would wear that until she was queen. Wanted to see their apartment in KP but they blurred it. I don't blame them for doing that either. You know how the media had every object labeled when the Queens sitting room at Balmoral was photographed. They kind of look like the ones she wore to the first State Dinner for the Chinese President? So wonderful to see that dress ! I thought it was funny that even the Queen doesn't mind sharing videos or pictures of her interior yet William and Kate refuse to ! They really need to relax a bit. The world wishes them well - enjoy it !! The blue gown and getup is simply out of the world. She looks even better than she did in the red gown. I never thought that pale blue is one of the colors that suits her the best, but now I do. As for the accent - what is up with that !! At some points it's almost garbled. Does she speak funny because she is in her "royal" mode? And why dont Pippa or James sound like her? Had no problem understanding everything she said. 03:49, I was asking myself the same thing. She sounded a lot different in the engagement video also. She sounds so overly posh this new video. Almost like a cariacture. I think it's because she's obviously incredibly nervous about being interviewed. "The world wishes them well" ??? I guess I missed that part in recent days, if not weeks. 2:36, immediately before the Gan-Gan comment, Kate said, "I think she's very fond of Charlotte...always watching what she's up to..."
Anon 03.49 Well, there is a difference. The photos of the queens interiors are usually from her offical and not private quarters. If this is filmed in William and Kates apartment, it's their private quarters and that is quite different from the official spaces in terms of how "guarded" you feel about it. For example, Victoria and Daniel in Sweden are very sharing with pictures and videos etc, but even they are very stingy when it comes to access into the private quarters. When you live your life in the public, having a private sphere becomes even more important. Same comment: she speaks fast and does not articulate very well, which is something that she should work on. Prince Charles or other senior members of the Royal Family are much easier to understand. lol, the forks are the least of their concerns at a function like that, although table etiquette is important. I love LOVE LOVE that blue McQueen dress! I'm so happy we finally get a good look at it!!!! Hopefully the documentary will be posted donline so those of us who live in the US will get to watch it too! Am I allowed to.complain about her hairstyle in the video? Lol ouch. I miss the old Kate blowouts of the old days. I love her in blue though! Oh Sarah Bless Your Heart! I like to think of you as our resident Miss Negavity! I say this with a smile. You are always steadfast on your opinions. I respect that! But you just almost ALMOST posted a comment that was totally without a negative. Lol you even recognize that as you asked if you could say something about her hair. I am Lmbo... too funny! So close Sarah.. you werethisclosetobeingmisshappyand alliswellintheworld. Loved the preview Charlotte. Kate looked lovely and seemed at ease in her remarks. Interesting video from yesterday's event on itv with comments from photographer Arthur Edwards, lady from EACH and the locals. Some will say its PR but Arthur is highly respected and you cannot dictate to what the general population say. I was surprised to hear the lady from EACH say that Kate offered to open the shop and that they did not ask her to come and do it. Yeah Anon 13.36. I also heard Kate say to a few of the people "Nice to see you again" which means she has met them before. You cannot dictate what the people will say, but you can edit the film to include people saying what you want in your interview. Not saying they did that though. I can't get over how beautiful she looks in that gown ! And Diana's tiara is pure perfection on her:) Amazed ! I thought I would share this link, because I am a photographer of sorts I always like to look up other famous photographers who cross my path. It is an interesting article from the other side. and interestingly too the photographer who was given prime position by the palace when George was born was the same man who took the ski photos. @Alimai: interesting article! All those lenses! A lot of money sitting in front of him ;) The only thing I have a difficult time with is that I don't have much respect for media photographers. I love photography though and loved the link you posted! Thank you. Thanks Alimai. That is nice to know. Kate's certainly had use from this coat! I am surprised that she uses it for public engagements AFTER she's worn it privately, though. A little short. Quite like the slightly different shoe style. Kate tries very hard to talk to the girl in front of the cameras. But, I do so miss Diana! It would be nice if the shop displayed a photo of Kate rather than that plate. I used to volunteer in a hospice and there was a wonderful photo of Diana in the reception area. Wow, that pale blue dress is stunning! I wonder if people realize how significant it is that Charles refers to the Queen as his "mother". I recall a time when she was strictly "Her Majesty" or "the Queen" when her children spoke about her. Something I thought about. When was the (cancelled) spanish state visit supposed to be? Even if William and Kate were not planned to be on the banquet, I assume they would have had some engagements connected to that. I wonder if the lack of those engagements have contributed to the feeling this spring. The daily mail has a peak at the special that will air Easter Sunday about the Queen. And besides the interview with The Duchess there is video from the diplomatic reception and we get to see Catherine in all her finery . Lovely day yesterday! I have been away on vacation and it was nice to come home to the blog and read the post. I love to see Kate interacting with children. You can tell she feels very comfortable and enjoys being around them. I have a feeling we'll see Kate back at the shop in the future to support them. As Charlotte mentioned, EACH brought many "firsts" for Kate and I think they hold a special place in her heart. Best of luck to the shop and EACH in trying to raise more funds. Thank you for posting a little sneak peak for us to see of the ITV program. I have to admit I got a bit teary when Kate said George calls the Queen "Gan Gan". My children call my mom the same and it pulled my heart strings. Kate looks incredible in the McQueen gown and Cambridge Lovers Knot tiara. It is definitely a WOW moment for me and she does look every inch the future queen. I will say William looks quite handsome too. :) I am REALLY looking forward to seeing the program and hope it is available to those of us across the pond. Thank you Charlotte for a lovely post and update! Have a wonderful weekend! I think this is my favorite post you have done Charlotte. EACH leaves me speechless. Reading that a child suffers from a severe form of Epilepsy made me tear. If you have ever witnessed an Epileptic seizure, it is one of the most horrifying things one could ever witness happen to another human being. To think that ANY child should suffer from any ailment, at all, at such a young age, just makes me think all the more highly of Kate and the patronage she chose. It is plain to see how natural it is for her to connect to children and how she genuinely loves it- a perfect fit for her. I really am so touched by the charity, I have no words for the clothes, tiara or anything else today. Charlotte - Do you happen to know how/if we can view "The Queen at 90" in the US? Okay. Please can anyone tell me what Kate says between "I think she is very fond of Charlotte's???? ?, what?" and "George is only 2 1/2...". Thank you for any help on this.